Today we are already at our third haibun Monday. If you have not participated before, please check out our first one we had in September. Each time we will use different ways to trigger inspiration. and today I wanted to use one single piece of art to inspire you. But first a few words on ekphrasis. As many other words it comes from Greek, and comes from “out” and “speak”, it means in essence any description, but it have come to mean a graphic often dramatic description of a piece of art. However, to merely describe the piece will not create the effect I am after today. One way to test your haibun is to see if the art, the prose and the haiku works by themselves, but combined you achieve something larger than the separate units. I have found that working with art from Vincent van Gogh often works very well. I have intentionally chosen a piece that is not one of his most well-known to avoid any previous feelings you have had. Dive into the painting and find your own prose, your own emotions. Or maybe start with the haiku and go from that. Try to see it with fresh eyes, put own your favorite music, and start writing. Try to keep your haibun reasonable in length, try to keep a clear narrative out of the prose, and use one single haiku at the end. Remember the prompt is open for a whole week, so there is plenty of time to write, read and comment on everyone. Leave a small comment below, and participate in our discussions. Hi my computer was slow so didn’t see your entry. I hope we get a lot of haibun based on this wonderful prompt. Having been to St. Remy and seeing the asylum and the chapel there, this painting was perfect. You can see the chapel from some of the windows of the nearby asylum. It is a beautiful place. I’ve always loved this painting of his done with that lovely shade of blue he seemed to favor and the shades of gold. The day I went, the sky was that exact blue. And I thought I had chosen a picture less known… What a wonderful place to visit. You didn’t know you had a Van Gogh groupie in the midst of the poets either! smiles. I know there was been several investigations into his suicide giving alternate versions of what really happened. Most interesting. I’m a Van Gogh groupie, too, Toni (no surprise, heh?) I’ve read those investigations that assert he was shot trying to protect a child who had accidently (?) discharged his firearm. We will never really know, will we? Ok….I posted too hastily, skimmed Bjorn’s prompt very quickly with the intent of getting back later…I will write about this and post a bit later. Thanks for advising me, Grace, and sorry about the first haibun…I will delete it if I can. Good evening friends.. I will get around later reading all the entries 🙂 I’m with friends drinking wine. Enjoy your time, Bjorn! And the friendship and wine. Hi everyone – Bjorn will be late but will be around later. I hope you all will give Haibun a try if you have not already. It is a very different poetry form. Looking forward to this. It will be my first Haibun! Wish me well! Good luck! You are wished well. It is an addictive form and to me, is wonderful because it contains prose and poetry. I ended mine with a senryu rather than haiku because the haiku just wouldn’t come! I don’t think it matters. So far there are some wonderful entries. You have read mine which is dark but the others are beautiful! I imagine you will do a bang up job! I went to a dark place with this prompt. so far, all other entries are light and full of hope and peace. Years ago I visited the Chapel and the Asylum at St. Remy and saw where Van Gogh had spent time at the asylum, admitted there by himself. He painted while there and saw this view many times, during different times. I thought of him there and others in that same peaceful place – Asylum in a true sense – a place of being away from the world, seeking healing. How wonderful that you had the opportunity to see this area, Toni! I think it added another dimension to your poem. I must go read it one more time. Smiles. The haibun is so different. The place is peaceful and while Van Gogh was there, I believe he painted this scene and it was hung in the hallway for a time. Now at the asylum, they still have a place for the “residents” to hang their artwork and some of it is actually for sale. I’m not sure and I had better check this so please forgive me if I misspeak, but I think that hallway or maybe the Asylum itself may have been known at one time as the Van Gogh asylum. I think that is what I remember but will check deeper. But there is indeed artwork on display – dating from the time his artwork was displayed there. He was deeply depressed over the death of his brother and went there to try to heal and to get away from the world. 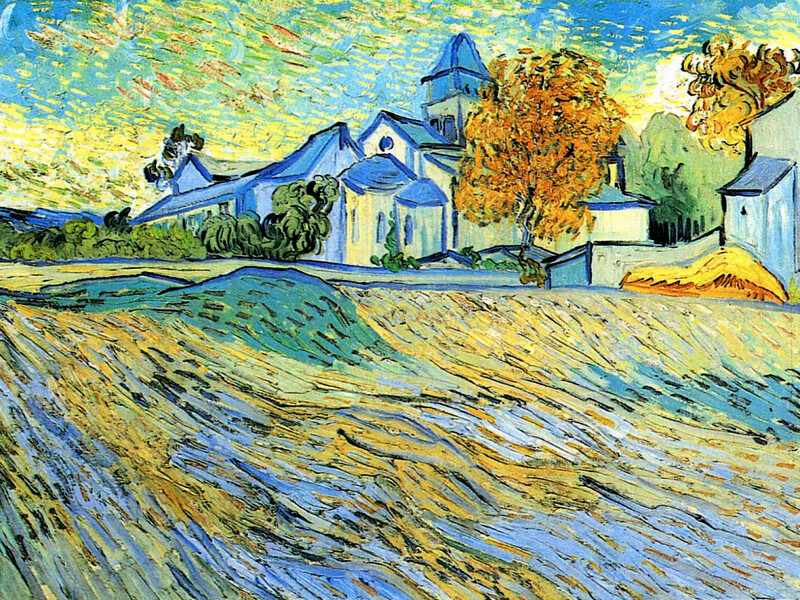 A great prompt – I love, love, love Van Gogh and, like you, Toni, retracing his steps in St. Remy, Arles and other places in Provence made his use of colour and texture, and his themes, somehow more understandable. I was eager to try my hand again at a haibun, but may have strayed a little too far from pure ekphrastic poetry. I don’t think any of us did “pure” ekphrasic poetry. I loved your haibun. So you and I and Victoria are all Van Gogh groupies….what fun! It was truly wonderful following his footsteps. I took a tour specifically tailored to that and it was enlightening and enlarging. Good afternoon, everyone! Thanks for the prompt, Bjorn. I like Vincent van Gogh, and I look forward to seeing what others will write to this painting. Could not resist this prompt, Bjorn. Thank you. I will be in and out until Thursday when I will be completely off the grid for a few days. The link for Tournesol does not work. Not sure how to let her know….. I left a message on her most recent haibun… hope she links up again. It works now–just tried it. When I went to her site, I found her haibun under a poetry tab. Okay. Thank you. I was expecting the link to take me to the poem. I’ll be linking up mine later in the week…since I have time, I’m going to ponder this one a bit longer. Thanks, Bjorn, for a very beautiful painting to use for our inspiration. I look forward to that Gayle… so great to have a whole week to revisit and read the entries. Thanks, Bjorn, I will be doing that. Joining in this morning… I wrote mine to a different image, but did my best to follow the rules with that, hope that’s okay. Looking forward to reading everyone else’s work, probably this evening. Nice to have you join up.. and I will make my rounds now. Remember that the prompt stays open quite a while yet. Great to have you here… the atmosphere is cozy and warm, and your haibun fabolous. Ah.. I think we need to find our own story in each picture. That is part of the wonder of art…of poetry and painting. We can share our own stories! I agree with you, Lynn. And I love reading the personal stories that arise from these prompts. Thank you, Björn for this lovely painting prompt. I enjoyed looking at it for a couple of days and being inspired by it. So much of my poetry has been depressing lately as I work through some things. This turned my mind to more lovely things. There are so many things you can find in a picture… and sometimes a little extra time pays off. I really appreciate the time and thought you put into this post, Bjorn…thank you! I love prompts from artwork and you are so right, Bjorn, there is something about his work that takes you on a creative journey. I especially appreciate your advice …. Late too, but not too late I trust. Been away, and since returning home have had horrendous internet problems. Have finally come to the library to log into their free internet, but can’t live here so it may take time for me to read other people’s efforts, sorry. I will, though; would hate to miss out. Not too late Rosemary, and a wonderful haibun you wrote.